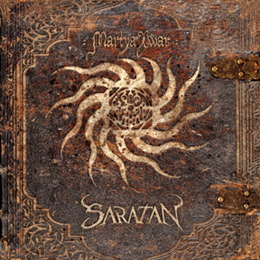 Martya Xwar starts with an Oriental intro, somewhat Arab-Indian (with sitar etc. ), finely introducing another furious assault of groovy yet strictly un-catchy Thrash / Death Metal with a plain-technical undertone. And compared to Antireligion (My Kingdom Music, 2010), this album is much stronger and matured (or better: less pubic and pathetic). The Oriental (Arab / Indian) influences come in a pretty perfectly-balanced equilibrium, the Machine Head-alike grooves and Behemoth-outbursts are wonderfully well transformed into a pretty own-faced, rather unique vision, and that’s a relief in comparison to the past (sorry, MKM, but that isn’t but the truth). Not every single piece is enthralling, but more than before, this album has several excerpts that grab my attention with modest persuasion. Another progression: the technical parts: less eccentric (read: less exaggerated), yet much, much more balanced and, for sure, in a better combination with the global atmosphere; the latter being the most oppressive, apocalyptic one to date. Lots of highlights, no annoying, without any doubt Saratan’s most intriguing effort to date!